Our aim is to raise awareness of the Frontier Wars in the lead up to Anzac Day, to lament the suffering caused and the injustice done and to unite in resolution to end it. 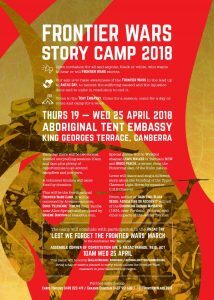 Come to the Tent Embassy. Come for a session, come for a day or come and camp for a week. Each day there will be two formal, themed storytelling sessions 10 am and 4 pm plus plenty of opportunities to sit around campfires and just yarn. A volunteer kitchen will cater. Food by donation. This will be the fourth annual Frontier Wars Camp. It will be convened by Arrentre activist, Chris “Peltherre” Tomlins from Yamba near Alice Springs and produced by Graeme Dunstan of Peacebus.com. Special guests will be Widabul shaman Lewis Walker of Tabulam NSW and Bruce Pascoe, a writer, from the Bunurong clan, of the Kulin nation. Lewis will dance and sing a very different and very grim story about the founding, in 1885, of the Upper Clarence Light Horse by squatter C.H.E Chauvel, father of General Sir Harry Chauvel. Bruce, author of Dark Emu: Black Seeds: Agriculture Or Accident? will tell of the Convincing Ground Massacre (1834 near Portland, Victoria) and other impacts of the settler frontier. The Camp will conclude with participation in the Anzac Day “Lest We Forget the Frontier Wars” March to the Australian War Memorial. This March will be led by Ghillar Michael Anderson (http://nationalunitygovernment.org/) and assemble at the corner of Constitution Ave and Anzac Parade, Reid, ACT from 10 am Wednesday 25 April. Bring a flag or make a placard to carry which names the frontier war massacre in your home town or region.